After breakfast, proceed to Tirupathi. Lunch at local restaurant Tirupathi is a temple town known for the famous ancient temple of Lord Venkateswara (Lord of seven hills or Balaji, as he is affectionately known) on the top of the 860mts high Tirumala hills. The temple of Lord Venkateswara is not only believed to be amongst the oldest temples in the country, but also the richest of them all .Legend has it that Lord Venkateswara borrowed money from the divine treasurer Kubera for his wedding expenses. He is still paying back this debt which is why the pilgrims donate generously to the temple funds. In the evening return to Chennai. Overnight at Hotel. After breakfast drive to Kanchipuram ( 76 kms/01.50 hrs ) - is the ancient capital of the Pallavas famous as a city of 1000 Temples and still has 124 shrines. The first temple dedicated to Shiva was built in the 7th and 8th century and has paintings on the walls. 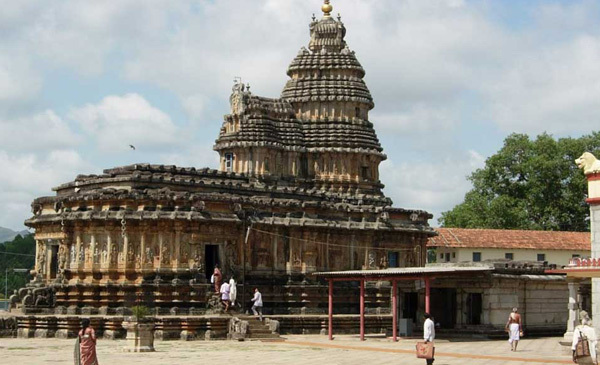 Temples of Ekambaswara , Kailasanatha, Sri Kamakshi and Varadarajaswamy are of interest. Kanchipuram is also famous for its silks. Lunch at local restaurant and later drive to Mamallapooram and check in at hotel. Afternoon visit the city - built in 7th century, earlier called Mahabalipooram, this ancient Pallava port, is today the sight of several antique sculptural marvels. In this ancient seaside town , shrines and huge sculptures cut-out of rocks more than 1200 years back during the reign of Pallava Kings in the region can be seen. The rock carvings depicting mythological episodes - of demons, Gods and animals in battle and others - are truly poems in stone. The only shore temple which remains here is the spectacular two - spired shrine, unique because it houses both Lord Shiva and the Lord Vishnu in its sanctum-sanctorum. Overnight at hotel. After breakfast drive to Tiruvannamallai (112kms/03hrs) - a pilgrim centre with an ancient temple of Lord Shiva. After lunch at local restaurant, proceed to Pondicherry (131kms/ 3.5hrs), which carries a strong whiff of the French presence in India. This erstwhile French colony on the east coast of South India merged with the rest of the country in 1954. Legend says that Pondicherry is the place where St.Agasthaya settled down. Overnight at hotel. After breakfast drive to visit Aurbindo Ashram, the city of dawn, which is 10kms north of Pondicherry. This ashram promotes Aurbindo's ideas in bringing about a synthesis of Yoga and modern science, so as to unite the spirit and matter. After lunch at hotel, visit Auroville - a unique experiment in international living and in creating a new environment where men and women of all nationalities live together in harmony. Overnight at hotel. After breakfast drive to Chidambaram (65kms/1.5hrs) also called as Thillai, which has the famous Nataraja temple with the root of the sanctum-sanctorum covered with golden plates is located in the centre of the town covering an area of 40 acres. In this temple, postures from the Bharatnatayam form of dance are depicted in sculpture. Natraja is Lord Shiva as a cosmic dancer. After lunch at local restaurant, drive to Thanjavur (104kms/03hrs) enroute visiting the Brass factory at Kumbakonam. Tanjore once the capital of Chola Kings, has the Brahadeswara temple(or the big temple of God).The temple tower rises to a height of 15mts from a square base of 29 mts and then tapers off, making a total of 66mts.Checkin, Overnight at hotel . .
After breakfast leave for Trichy, short name of Trichurapalli, situated on the banks of Kaveri River is a blend of history and tradition as well as pilgrim centre, it is famous for Ranganath temple at Srirangam. Checkin at hotel. After lunch city tour visiting Rock fort and its temple at a height of over 23mts. Also visit Srirangam and Jambukeshwar Temple. Overnight at hotel. After breakfast proceed to Madurai and checkin at hotel. The ancient city of Madurai, some 2600 years old is laid out in the banks of river Vaigai as a lotus flower with the Meenakshi temple in the centre. After lunch city tour visiting - Meenakshi temple, King Tirumala's Palace, Great tank and Gandhi museum. Overnight at hotel. After breakfast proceeds to Rameshwaram- the most sacred temple town of India is an island hallowed by the epic Ramayana, where Lord Rama is said to have visited before going into battle of Srilanka. Legend has it that Lord Rama sent Hanuman to Mount Kailash to bring a Lingam for worship when he set foot after defeating Ravana. As Hanuman did not return when the auspicious hour was approaching, Sita made a sand Lingam so that worship could be performed in time, which is where the present day Ramanatha Swamy Temple stands close to sea on the eastern side of the island. One of the twelve Jyotirlingam shrines is also well known for its magnificent corridors and the massive sculptured pillars lining them. Lunch at local restaurant. Return to Madurai for dinner and overnight stay at hotel. After breakfast drive to Trivandrum and check in at hotel. Afternoon at leisure. Overnight at Hotel. After breakfast proceed for Kanyakumari - is the land's end of India where the water of the Arabian Sea , the Bay of Bengal and the Indian Ocean meet. An important pilgrim centre of India, it is famous for the Amman Temples - a symbol of unity and sanctity - dedicated to the virgin Goddess , Kanya Kumari. To its South - East lies the famous Vivekananda Rock Memorial, a blend of all the architectural styles of India. Evening enjoy the beautiful sun set and later return to Trivandrum. Dinner and overnight at hotel. After breakfast transfer to airport to connect flight for onward journey. End of our services.